Consuming less than 1 A, Jacoby-TarboxÂ® Phaeton XTL lights provide bright, clean light for viewing into any vessel with 4 in. or larger window, including large silos. View through feature allows same window viewing, eliminating need for second window by combining illumination and viewing in one. Lights stay cool to touch, eliminating potential burning hazard. FM approved for hazardous areas, models are available with 6 or 4 in. dia, which can be nested on same window for increased brightness. STRONGSVILLE, OH - A new series of storage vessel illuminators has been introduced by their manufacturer, Clark-Reliance Corporation. The new Jacoby-Tarbox® Phaeton XTL lights combine simplicity with brilliance to provide bright, clean light for easy and safe viewing into any process or storage vessel. The new LED technology employed provides 33 times the brilliance of previous generation LED lights, enough light to inspect inside even large silos. The Phaeton XTL lights' "view through" feature allows same window viewing, eliminating the need for a second viewing window by combining illumination and viewing in one. Because they consume less than one amp, the lights stay cool to the touch, eliminating the potential hand and face burning hazard of old-style halogen inspection lights. They are rated for over 10 years of continuous duty. No maintenance other than cleaning is needed. Cleaning takes seconds while the lights are unclipped and wiped down without requiring disconnection from power. Two models are available, with 6" or 4" diameters. For the ultimate in illumination, the two sizes can be nested on the same window to provide 66 times the brightness found before. 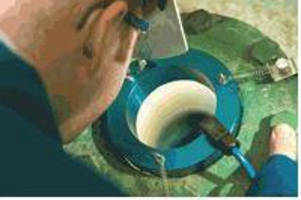 Installation or retrofit takes less then two minutes on any vessel window 4" or larger. The lights are available in 240V AC or 120V AC or source, and are FM approved for hazardous environments.